This is officially the world's largest party of drunks. I did not see anything new in the past years which I hadn't seen in previous years, so if you're looking for pictures of Streetparade, just look at my pics from previous years, you won't notice the difference. People with the same tired outfits going through the same motions to lame music like robots. They should have stopped this event with 2013's Best Parade Ever, since then it's become irrelevant. As in "stop when it's the best". Overwhelmingly crappy music (even stuff from the pop charts! ), mostly spectators with essentially no costumes or makeup, drunks everywhere, lots of smelly people urgently needing a shower, and stinky food stalls all over the place. And beware! As a freindly good bye present, the Zurich police sets up road blocks after the Parade to slap drunk drivers with notoriously stiff fines! Yuck! After last years' debacle, I had finally given up Streetparade for dead and was expecting a rerun of things gone stale. Being a Nikon guy, I visited the parade for the sole reason of testing some unfamiliar Canon gear in an action-packed event. But boy, was I mistaken! The music pulls this donkey's cart and the contemporary sound totally rejuvenated the whole show this year. Wow, surely one of the best Streetparades ever! This was one of the worst Streetparades. Although the weather was good, the players were not, nor was the music. Seems like we're going through the motions of a bygone fad and maybe a great idea has been stretched too far. Everything seemed so - normal! The extremes were missing. Sorry guys, hope things improve in 2013. Warm and sunny, but not hot weather. Music, crowd and atmosphere not quite as good as 2010, with a lot of non-participants. Perhaps bad weather is good to give a higher density of true fans? Less glass bottles than last year, which was a plus, but still more than enough shards to cause injury to the unlucky. This was the 20th anniversary of Streetparade. Great atmosphere, great music, great crowd! Except for the rainy weather, one of the best Streetparades yet. Started cloudy but dry, with the drizzle slowly getting worse as time went by. In the end it was a medium steady downpour. Some, but not all of the love-mobiles had disco-ey lights, which lengthened the party's life in spite of darkness setting in around 8:30PM. Alcohol has firmly gotten it's foot planted in the event, with beer everywhere and bottles of Vodka, Jägermeister and other hard liqor to be seen in quantity. With glass bottles being thrown and broken on the street, there is a real and serious danger of feet getting cut badly by the sometimes large razor-sharp glass shards (glass bottles should be banned and replaced with plastic ones). It looked like a rainy day but things got better as the event progressed. There wasn't really any sunshine, but nothing worse than a drizzle. Good weather, the crowd was rejuvenated, some aggressiveness (a first), lots of alcohol (a first). Wonder if the last two points are related? Good, mild weather, significantly less spectators. It was overcast, sunny, rainy, dry, warm and cold during this year's event. Even though Streetparade is showing signs of age, it's participants have aged, and significantly fewer people took part this year, there is no question: this is still a world class event! Street Parade is one of Zurich's (and Switzerland's) major events, and hardly needs an introduction. It's a parade of colour, creative costumes, accessories and make-up, with most ravers in a great, tolerant mood turning exhibitionist for a day. 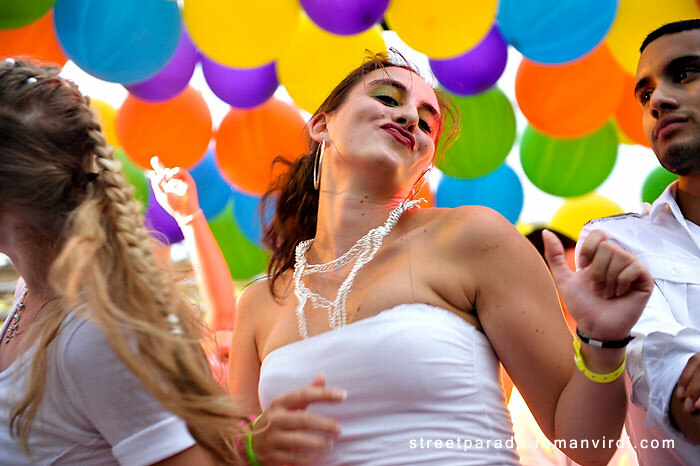 It's great fun to be raving at Streetparade even if you don't particularly like Techno. Photographers and videographers have a field day taking pictures at Street Parade, and I imagine an amazing number of pictures are taken. Tons of travelers travel from all over Switzerland but also from neighbouring countries. The hotels in Zurich are booked solid way ahead, so book early. * Be there in person, close up. Watching the event on TV can't compare to the real thing. * I tried earplugs once, but they took away too much of "the feel" (your risk). * I now start off late from Mythenquai (around 5:30 PM), when the first floats start coming in and walk against the flow. This reduces waiting times considerably and works well, considering the parade isn't quite as packed as it used to be. If you want to hang around longer, start much earlier at the starting point of the Parade: Utoquai. The crowds are the densest around Bellevue and the Quaibrücke (Quai bridge) till Bürkliplatz. * It's practically guaranteed to be hot/warm: light clothes and water help. A poncho was great for the exceptions of 2002, 2006, 2009 and 2010. An umbrella will probably poke someone's eye.